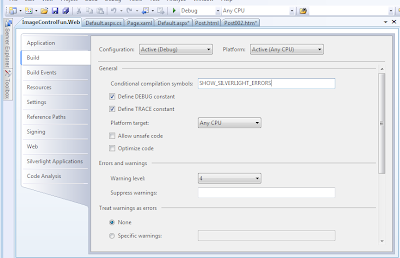 The dreaded AG_E_NETWORK_ERROR from Silverlight's Image control (a.k.a. Error Code 4001, ImageError). Basically, it means the image file you referenced in the Source attribute has some type of invalid Uri. The typical solution that most blog entries and forum posts offer is simply to fix your Uri reference. For more information on typical scenarios for setting the Image control's Source property, see Pete Brown's post on Path and File Resolution (it is still relevant even though it referenced Silverlight 2 Beta 1). Who Wrote This Control, Anyway? Sure, simply fixing the Uri may work for some, but what if you are accessing 3rd party feeds that are passing you invalid Url's or those images simply no longer exist? What if your application just can't gurantee that all the images you try to reference actually exist? It seems pretty poor user experience to popup a scripting error dialog--for each image that is missing! On top of that, the rest of the Silverlight page seems to stop processing! // icon in the status bar and Firefox will display a script error. // report the error to the website and stop the application. That made me realize that the Image (or Bitmap) control was somehow handling the exception and explicitly calling the onerror function that is set on the Silverlight control's param list (or via a similar property on the Silverlight ASP.NET control). 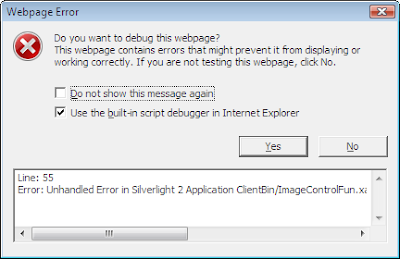 You can certainly ship your Silverlight application at this point, so that is great. If you are working in Scrum or some other agile environment, now is a good time to check in to Continuous Integration to have a "worst-case scenario" point that contains potentially shippable software! As a result, I recommend showing the errors during development, maybe even in your continuous integration environment, but suppressing them once in a pre-production or production environment. This can be accomplished using either a web.config setting that is read by your code-behind to decide whether your page should add this script block or not, or through conditional attributes on methods that decide whether to swallow the errors or not. If you like some combination of options, you could change the onerror param on the object tag (using web.config or conditional compilation) to call the default onSilverlightException locally and in your integration environment and call a different function that does logging in testing, pre-production and production. ...you are still left with an experience that leaves something to be desired. At least the user experience is not in-yo-face horrible anymore, but this is Silverlight. It's supposed to be clean, smooth, and high-quality. You get no image when there is an error loading from an invalid source url. There is no "loading" or "default" image that is shown prior to the real image being loaded over the network or in an error condition. Even worse, there doesn't appear to be any events, hooks, or override points to be able to respond to these things! I'm sure these issues all came as ways to ensure there weren't any security holes, but sheesh! Stay tuned for more iterative refinements on the user experience of the Image control (Behaviors and more)! For now, we've got something working. In the meantime, I'd love to hear any other solutions folks have come up with!